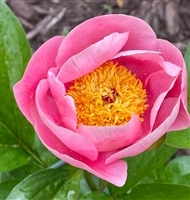 NEW INTRODUCTION REGISTERED WITH AMERICAN PEONY SOCIETY! 'Mystic Pink' [Herbaceous Hybrid] — LeRoy Mielke, Marion, WI — Seedling No. LM 10. Parentage: 'Lemon Chiffon' x 'The Mackinac Grand'. Purchased as one of a number of seedlings donated by Nate Bremer in 2012 for the Wisconsin Peony Auction. First year bloomed 2016, first year propagated 2018. Early bloom period, in Wisconsin first week of June. Large SINGLE, 8 inches in size (20 cm), 1 bloom per stem. Three rows of large petals, 3-4 inches wide (7½-10 cm), smoothly rounded, lightly creped, pink, fading to the outside edges. average of 3 carpels, light green, sparsely hairy. Stigmas bright red and normal. Pollen-bearing stamens, filaments red at the very base, the remainder yellow. Disc dusky-pink, only a few projections. Fertile both ways. Height to 36 inches (91 cm).